Facebook makes it extremely easy to keep in touch with family and friends, while maintaining those relationships with little to no face-to-face contact. It's the perfect tool for recluses. But, while having 1,000 Facebook friends may be "cool" to some, it's pretty unlikely that all of those people are really "friends." As the web continues to grow, so does online threats, which means keeping a tighter grip on who can access your information has never been more important. I mean, would you really want someone you met once at your friend's sister's quinceañera to have access to everything you have on Facebook, like that sultry photo of you licking some drunk girl's chest? Unfriending friends on Facebook is not difficult. All you need to do is go to that friend's page, click on the settings button (the gear symbol) and hit "Unfriend...."
You can also remove friends by filtering your activity log to show only your friends. 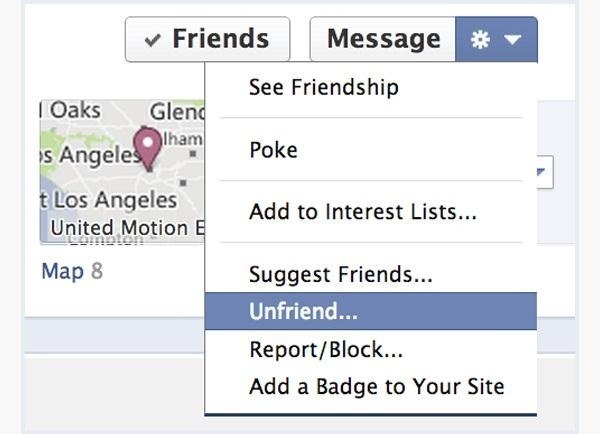 The just click on the Friends button and proceed to unfriend. But if you want to delete a bunch of "friends," this process can be very time consuming. Thankfully, there is an extension available on Firefox that allows for mass deletion. First, install the Greasemonkey extension to Firefox, then restart the browser. After restarting, go to this page to install the "Mass Facebook Friends Deleter" userscript. Once the script is installed, two new options will be available in the Friends tab on Facebook. "Delete all Friends" and "Delete Selected Friends." I doubt I need to explain further how this works. But now you can delete those inactive and unnecessary "friends" in just a few minutes, rather than spend hours clicking, clicking, and clicking. I figured it out! Download the script as instructed but then what you need to do is go to your friends page, then copy the url of that page. Next, click on the down arrow next to the greasemonkey logo in firefox, then select manage user scripts, it will take you to the firefox add ons manager page, select preferences, then select add. You will paste the url from the "friends" Facebook page into the url box, then click ok. Once you do that, go back to Facebook and refresh your screen, you will then see the check boxes next to all your friends and the two additional tabs to select all or delete selected friends.